Although most people know that coral reefs are found throughout the world in tropical oceans, many do not realize that these reefs are actually living animal colonies, and that they are very important in the tropical ocean ecosystem. The coral reef is an integral part of the cycle of life in the tropical seas, and are home to thousands of species of fish and invertebrates. The reef is made up of small colonial animals, called coral polyps. Coral polyps live on plankton and also on sunlight, utilizing symbiotic algae in their skin tissue to augment their diet. This makes reef growth possible in the nutrient-poor tropical ocean water. The reef then provides nesting areas and hiding spots for numerous species of small fish and invertebrates. These in turn attract larger animals to the reef in search of food. Therefore, a coral reef can turn an otherwise barren patch of sand into a bustling marine metropolis. All of this is made possible by the tiny coral polyps, most no larger than a single pearl. Join Oceanic Research Group as we learn how coral reefs grow, why they are important, what is threatening them and how everyone can help save them. This exciting film features stunning underwater cinematography as well as computer-generated graphics, along with a beautiful soundtrack to help introduce viewers to the wonders of the coral reef. You can WATCH THIS FILM on-line! While this film is designed for ages 13-adult, a sister version for younger audiences (ages 8-12) is also available. This film was produced to celebrate 1997, the International year of the Reef. "An excellent visual tool that provides a broad look at coral reef concepts and issues along with images from a habitat that students would not otherwise see. 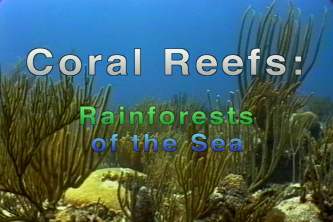 The video's format makes it an ideal introduction to a unit on coral reefs or marine science." "The pictures of this vast array of sea life are stunning! These two videotapes ["Coral Reefs: Rainforests of the Seas" and "The Amazing Coral Reef"] are very well done and would be very useful in an educational setting designed to enrich the study of coral reefs." This program would serve well to illustrate how delicate the reef ecosystems are, and explain the meaning of biological interdependance. The video is thorough in its aim to show the beauty of coral reef communities, describe what reefs are and how they are made, tell why they are important to the health of the oceans, and report on the state of the world's largest reefs. This well written and well-produced program is entertaining as well as sobering." This film won the 1997 CINE Golden Eagle Award, the most prestigious educational film award in the United States.